The 2012 Nissan Leaf, Nissan’s 100% electric car, is now available nationwide. This compact car does not require gas; in fact it doesn’t even have a tailpipe. The Nissan Leaf can go about 100 miles per charge in city driving conditions and can reach speeds up to 90 miles per hour. In addition to advanced technology on the outside, the interior of the 2012 Nissan Leaf features several conveniences. Nissan push button start, automatic temperature control, trip computer, Bluetooth hands free phone system, and heated seats are just a few of the amenities available on the 2012 Nissan Leaf. 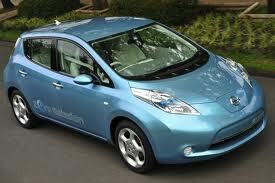 To encourage drivers to go green, there are rebates and incentives to those drivers who purchase the 2012 Nissan Leaf. Federal incentives include an income tax credit of $0-$7,500 for the purchase of a new qualified plug-in electric drive motor vehicle. Other incentives and rebates vary by state. Stop by James Ceranti Nissan today for details. The history between the Nissan GT-R and Porsche 911 is quite lengthy. Each car is the other’s nemesis, constantly trying to one up the other year in and year out. But what would happen for the 2012 model year, would the Porsche 911 finally overcome the turbo speed of the GT-R? In the following video, Evo magazine editor Tiff Needell has the lucky job of taking the 2012 Nissan GT-R and 2012 Porsche 911 out onto the Bedford Autodrome. Enjoy the twists and turns of the Bedford Autodrome track which really helps show off these supercars and ultimately will differentiate the superiority of one over the other. Nissan will be putting their new racing vehicle, the DeltaWing, on the big stage with a full film documentary about the design and build of the vehicle. Just as they did with the Juke-R last year, Nissan will be having episodes surrounding the development of the DeltaWing. The new film series will have a new episode around every two weeks leading up to the Le Mans in June. A complete TV documentary will follow the Le Mans race. A film crew has followed DeltaWing designer Ben Bowlby and his team as the racing machine was built including the engine being developed. Ben Bowlby said, “We’ve had the Nissan film crew following our every move throughout the development of the car over the past few months and this will give the fans a great insight into the creation of the Nissan DeltaWing. It was a bit strange at first to have a camera poked under our nose all the time but, after a while, the guys really felt like part of the team. The first episode is based around the DeltaWing getting prepped for the wind tunnel. The aerodynamic results from the wind tunnel test will determine if the DeltaWing is designed to be a success or failure. Enjoy! The Nissan Altima has long been a powerhouse in the auto industry and was the second-best selling car in America for 2011. That’s not good enough for Nissan though. Nissan is now making a push to become #1 with a completely redesigned version for the 2013 Altima. The brand new 2013 Nissan Altima was completely redesigned for looks, driving experience, technology and more. Nissan President and CEO Carlos Ghosn was at the New York Auto Show for the reveal. “This new Altima builds on the fundamental reputation earned over four generations for quality and reliability — and adds class-leading levels of value, innovation, dynamic performance and premium style,” said Nissan CEO Carlos Ghosn. Altima fans will have to sit tight until June before the 2013 version goes on sale. For now, the video of the revealing of the 2013 Altima will have to do.